TORONTO, August 14, 2014 – Avanti Computer Systems Limited, a leading provider of Print MIS and Web-to-Print solutions, today announced the release of Avanti Slingshot’s Advanced JDF Framework workflow module, the company’s newest addition to their award-winning Print MIS platform. The new module, which was awarded a 2014 MUST SEE’EMS on August 13, will be featured at Graph Expo 14, September 28 – October 1, in Chicago. Avanti Slingshot’s Advanced JDF Framework workflow module provides a platform to easily integrate the industry’s leading workflow offerings such as Xerox FreeFlow™ Core, Ricoh TotalFlow™, HP SmartStream™, Kodak Prinergy™ and Konica Minolta Printgroove™ into Avanti Slingshot. This preserves both data integrity and ensures cross-system communication, vital to realizing the benefits of Computer Integrated Manufacturing (CIM). JDF has evolved into a standard that now encompasses over 1,000 pages of specifications resulting from the broad range of nuances that the CIP4 organization includes in the standard. The Avanti JDF Framework uses templates built from validated JDF standards Interoperability Conformance Specifications (ICS). All of the information required in JDF has a place in the Avanti Slingshot platform, ensuring that the JDF being sent from Avanti is always valid and requires no troubleshooting. Avanti Slingshot incorporates business intelligence (CRM, dashboards and reporting), production planning (estimating, imposition, automated purchasing, sales orders, inventory management and scheduling), warehousing, shipping and billing into one easy-to-use and easy-to-implement system. Avanti’s Advanced JDF Framework creates a seamless information and data-transfer link between the Management Information System (MIS) software, prepress, production and bindery equipment. It provides an environment where all the software and equipment in your shop can speak the same language. Avanti’s Advanced JDF Framework gives any shop the ability to connect their “islands of automation” and send automated job instructions to a machine using JDF, and the machine can then send production information back to Avanti using JDF and/or the Job Messaging Format (JMF) in order to update job status, collect costs, and adjust inventory…all in real time. The machine can then send information back to Avanti using JDF and/or the Job Messaging Format (JMF). When a job is originally created in Avanti Slingshot, the Avanti Advanced JDF Framework will send as much detail as can be interpreted by the system receiving the job. This information includes, among other things, job ticket numbers, job descriptions, size, colors, media information, quantities, and content files. Implementations of this nature would typically take months in other Print MIS systems, incurring significant costs. 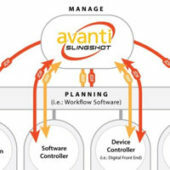 Leveraging Avanti’s JDF integration module within Avanti Slingshot, new integrations can be achieved in mere days, thereby reducing overall integration costs and rapidly improving ROI. September 27th – October 1st, at Chicago’s McCormick Place. For 30 years Avanti has provided innovative, award-winning Print MIS and web-to-print solutions that help print-shops and marketing communication organizations automate all facets of their business and cultivate a more meaningful customer relationship. Avanti’s solutions are the most open in the industry; are JDF certified, fully integrated, and extend from web-to-print through to production and billing. www.avantisystems.com.